Stress, feeling lack-luster and fatigue is something that many of us encounter in modern life. Power plays arise when we try to spread ourselves to thin and this frequently results in a lack of focus on ourselves- but this is something only we can change! Our behaviors turn into harmful habits if they remain unchecked, remember that health encompasses the whole package of our physical, emotional and mental wellbeing. Rest and relaxation is how we gather our strength and we can do this by any means, we can relish the silent moments we have to ourselves rather than attempt to fill quiet time with keeping busy, we can take part in gentle activity like light yoga, gardening, or walk that nourishes our mind, body, and soul. Even a self-indulgent bath a few times a week rather than a speedy shower can help rejuvenate us. Here we look at a few ways we can brush up for health and beauty. Skip the gym and take a walk outdoors instead. Breathe some fresh oxygen into your lungs and set a rhythm as you walk with purpose and with heart. Nature refuels us effortlessly. If your skin is showing signs of drying out, looking tired, or just over-exposed to the elements, treat it with some overdue love. Facial and body brushing helps to cleanse, exfoliate and moisturize your skin. Improving our circulation means that our cells and organs are receiving optimum nutrients for health, wellbeing, and regeneration. Think of it as the highway that speeds along oxygen-rich blood to your body. Obviously, we improve our circulation through cardiovascular exercise and eating well. Other ways that we can support ourselves better in this way is the message; it helps stimulate our circulation, dilate our blood vessels helping to decrease blood pressure, and flush lactic acid and other toxins from our muscles and organs. Iron is also an important mineral for circulation as it oxygenates our blood and water of course…moves everything along with greater ease! Everyone’s days are filled with countless stressful situations, it would seem. As a company, Rengöra set out to do something to help people step away from all that pressure, even if only for a few moments each day. That’s how their mission was born! The sole purpose of their products is to provide an escape for people—to help them rid their lives of anxiety, stress, and tension. Rengöra is based in South Pasadena, California and focuses on bath and beauty products that promise to deliver the ultimate bath time experience. In Swedish, Rengöra means “to brush” or “to clean.” This word therefore simultaneously describes the purpose of our products and reflects our Scandinavian roots. 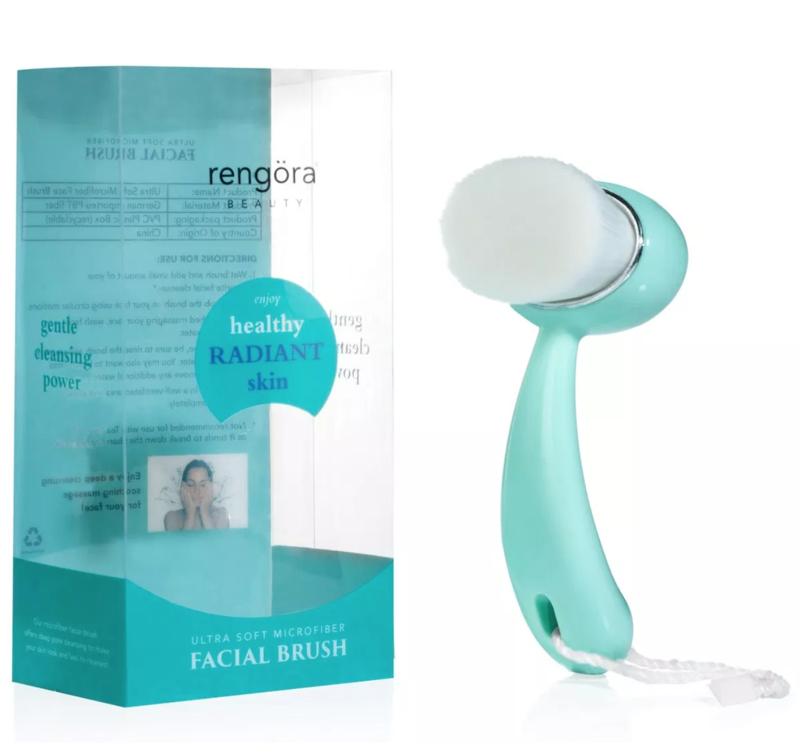 Rengöra's current product line includes luxury bath products and accessories – from bath brushes and body exfoliators to loofahs and bath bombs, all meant to help their customers feel good, peaceful, and relaxed, as well as soothe their nerves and muscles. Great for the body and the soul, Rengöra's products have helped numerous people find their inner relaxation. This provides them with the motivation they need to keep going. “We have one goal in mind: To help even more people around the globe "…relax and find the joy in life!" said Rengöra. Are you looking for a way to get that pristine, perfectly clean, smooth face you've been dreaming of? Are you tired of spending your time and money on products that promise to help you minimize blackheads, blemishes, and large pores - but often end up making things worse? If that's the case, then it's time for you to try something new. This wonderful facial cleansing brush is exactly what you've been looking for! Super Plush Pore Cleanser: This cute little plastic face brush is soft enough for a baby, but will wow you with how fresh and clean it makes your skin feel! Great for Teens As well As Adults: Expand your exfoliating system to include this colorful blue/teal face massager whether you are acne prone or simply looking for the gentlest cleansing device for your face. Enjoy A Deep Pore Cleanse - Suitable For Even the Most Sensitive Skin! Unlike other face brushes, this brush is not too stiff, rough, or harsh. It's surprisingly soft and feels like silk on your skin! You can officially forget about clogged pores and all the skin problems they cause. This facial massage brush will do what all those skin care products and scrubs couldn't—give your face a clean, fresh, radiant glow! The brush's ultra-soft bristles will remove dead skin and tiny pollutants from your pores, keeping your skin deeply cleansed thereby preventing blemishes and pimples. Plus, the brush is so soft it will not cause any abrasions or redness - not even if you have overly sensitive skin! This amazing facial cleansing brush is also simple to clean. Just use warm water and liquid soap to wash the brush, let it air dry, and it will be good as new! Ergonomic, Practical, Easy To Use & Clean - What's Not To Love? Exfoliating Body Brush: Discover the Body Brush That Will Transform Your Dry Itchy Skin into Softer, Smoother, Beautiful Skin! Are you searching for the most luxurious exfoliant that will bring relaxation and cleansing to new levels in your life? Your cleansing routine is about to be revitalized, + Rengöra is here to make it happen! Detoxify Your Entire Body: stimulate your lymphatic system by gently brushing your skin. (Free e-book with dry brushing tips and techniques is e-mailed to you after you order). At-Home Spa Experience: Improve circulation, clear up back acne, and remove ingrown hair & toxins! Reach Hard To Get Areas: our long handle and ergonomic non-slip grip make exfoliation of your whole body possible! 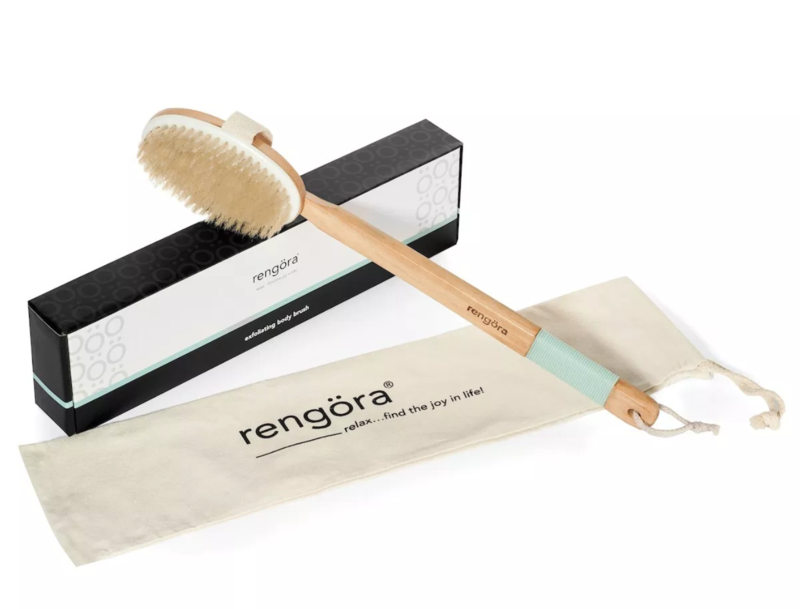 The Rengöra Exfoliating Body Brush: Enjoy a soothing, dry brushing experience with our luxurious body brush. Invigorate + add a healthy glow to your skin. The brush head is detachable and comes with a convenient cotton strap that will make your life so much easier! Massage the areas of your body that are affected by cellulite and gradually decrease the appearance of it by improving circulation in the area, removing toxins, and encouraging lymphatic drainage! Rejuvenate - Revitalize – Invigorate with Rengöra!